Google has come out with their transparency report for Jan to June 2014 and it is clear that Government is increasingly asking for more user accounts and data disclosures than previously. 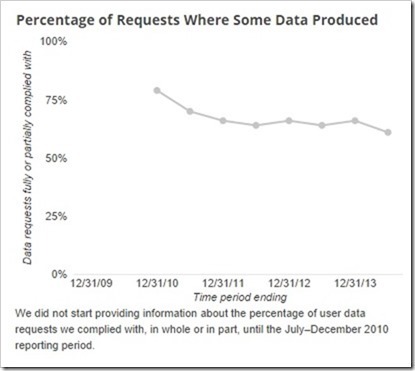 Since Google started releasing the transparency report in 2009, the requests have been steadily increasing. However, while the requests have increased, the percentage of requests that have been honored by Google are also coming down. Around 2010-11, around 8 out of 10 requests were honored. However, now that percentage has dropped to 6 out of 10 requests. During the first half of this year, Indian Government made 5002 users/account requests, more than anytime previously in a six month period. Even on the user data requests (disclosure of user data from Google accounts or services. ), the number has risen to 2794 higher than anytime previously. However, from user perspective there is a good news – Out of all the requests made by the Government only about 61 percent were disclosed. Compared to World average the disclosure percentage in India was lower (Global average is 65%). If you see the graph below, it clearly shows that Google has been increasingly disclosing lesser data than what it did previously. While Google was the first one to come up with Transparency reports, most other large online companies like Facebook, Microsoft and Twitter have also started doing the same. The transparency data provided by Google is good, but it still does not give the break-up of which kind of users accounts were requested to be disclose like whether it was on Youtube or for Gmail etc. Also, Google has stopped providing details of content take-down requests like whether it was a Youtube video or a blog post etc. Interestingly, Google used to provide this data in 2013. At a global level, a total of 31,698 user data requests and 48,615 users/accounts requests were made by Governments across the world. United State Government made maximum number of requests (12,539 user data & 21,576 users accounts) followed by India. Germany, France and United Kingdom rounded off of as top 5 countries who made maximum requests to Google. Interestingly, United States also led the pack when it came to information disclosed with Google producing some data for about 84 percent of requests (compared to 61% of India). Single Phone vs Multiple Phones Per Category- Which Is A Better Business Approach?